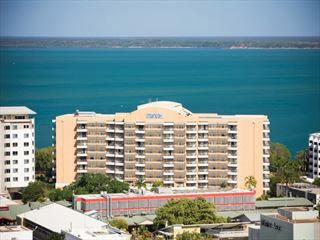 Adina Apartments Hotel Darwin Waterfront, book at Australian Sky today. 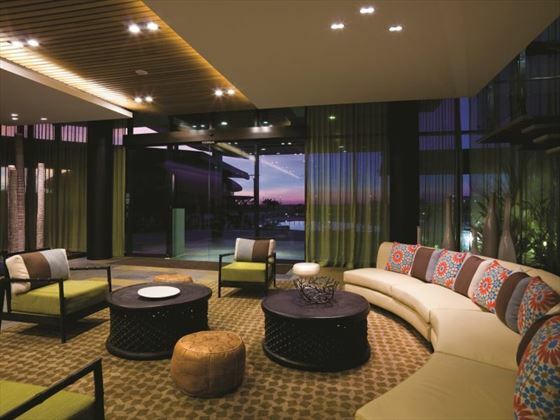 Adina Apartment Hotel Darwin Waterfront offers contemporary, stylish apartments close by to Darwin’s best attractions, restaurants and shops. Nestled in the Darwin Waterfront Precinct – the newest and trendiest part of the city – you’ll be close by to the lush Bicentennial Park, the esplanade, and the delicious seafood offerings at Stokes Hill Wharf, as you enjoy modern amenities and chic decor. Though there are plenty of restaurants nearby, the hotel has its own fantastic restaurant, offering simple, comforting dishes and fruity cocktails to toast a busy day wandering through the city. The ambience here is friendly and welcoming, and the fashionable apartments are perfect for a couple looking to explore and enjoy the sunshine. 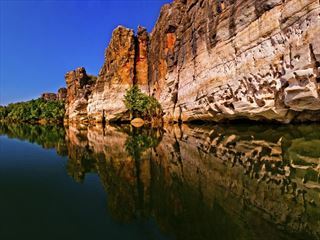 After a tasty breakfast at Curve Restaurant and Bar, wander along to Darwin’s Deckchair Cinema and the bustling Mindil markets to while away the afternoon, or head to the manmade Wave Lagoon, with a fun wave pool and gorgeous views. 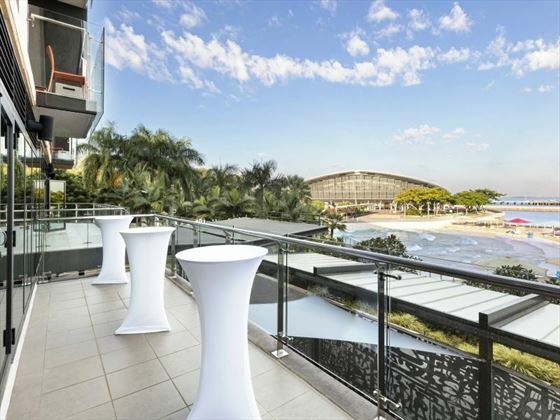 These modern apartments overlook the glistening Darwin Waterfront Recreational Lagoon, only a short distance away from the bustling Central Business District. The contemporary waterfront adds to the trendy ambience of the apartments, with gorgeous views and plenty of restaurants, bars and shops. 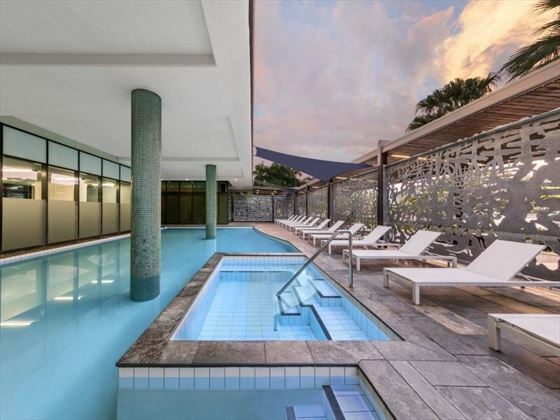 The apartments are only a 20 minute walk to the luscious Bicentennial Park and Darwin’s esplanade, with an 11 minute walk along to Stokes Hill Wharf - a lively food centre with a plethora of seafood eateries. 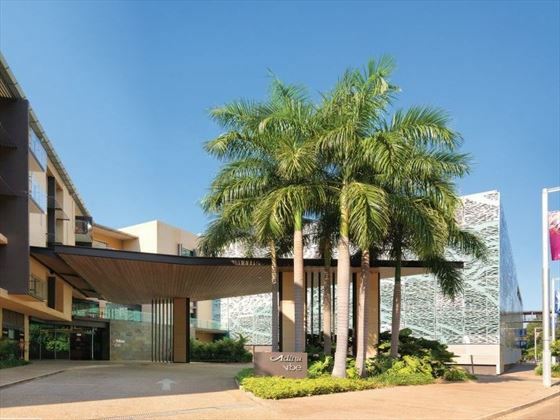 The apartments are approximately a 13 minute drive from Darwin International Airport. Premier Studio King or Twin – Chic studio rooms with standard amenities and a balcony (subject to availability). Sleeps a maximum of two adults, one child. 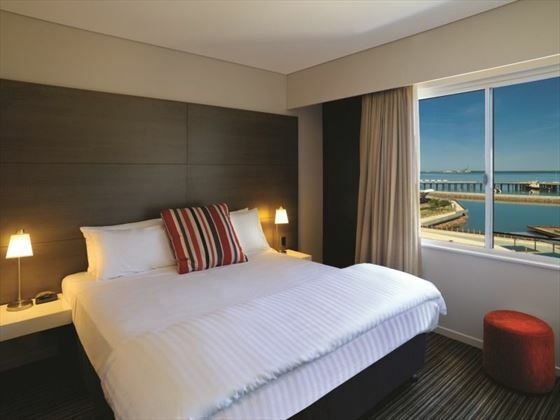 Premier Studio King or Twin with View – Trendy studio rooms with the same amenities as before, plus a lovely view of the waterfront. The balcony is subject to availability. Sleeps a maximum of two adults, one child. Premier One Bedroom Queen with View – A stylish one bedroom apartment with a view of Darwin Waterfront, a kitchen, and a separate lounge/dining area. Balcony is subject to availability. Sleeps a maximum of two adults, one child. Premier One Bedroom King or Twin – Gorgeous one bedroom apartments with a kitchenette and lounge/dining area. Balcony is subject to availability. Sleeps a maximum of two adults, one child. Premier One Bedroom King or Twin with View – With the same amenities as the Premier One Bedroom King or Twin, plus an expansive view of the waterfront. Balcony is subject to availability. Sleeps a maximum of two adults, one child. Curve Restaurant and Bar – Offering simple, tasty meals for breakfast, lunch and dinner. There is a choice between café-style cuisine and a hot and cold buffet during breakfast hours, and a delicious all-day dining menu for lunch and dinner. Open 6.30am-10am, 11am-6pm and 6pm-10pm. In- Room Dining – A variety of dishes from the all-day dining menu can be cooked and bought to your apartment. Open 24 hours. 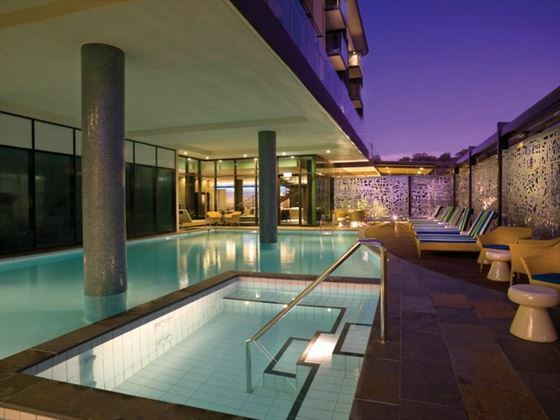 The Element Day Spa – Guests have access to this beautiful spa next door to Adina Vibe Hotel. With relaxing, holistic treatments including hot and cold stone therapy, and beauty treatments including waxing and tanning, head here to alleviate stress and leave feeling gorgeous inside and out. Free breakfast offer Stay 2 nights and receive full breakfast daily. Valid up to 31 Mar 20. 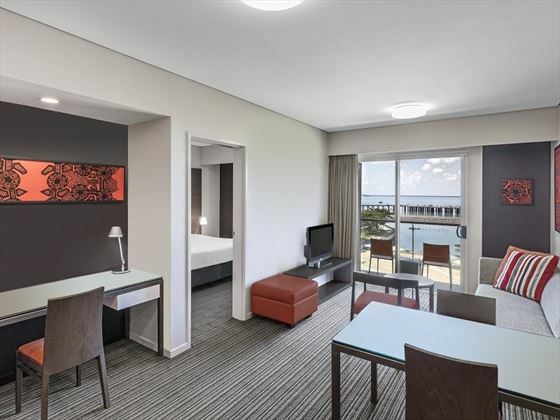 With beautiful views of Darwin's skyline on one side, and the quaint waterfront and sparkling harbour on the other, this resort is a tropical paradise right in the heart of the charismatic Darwin city. 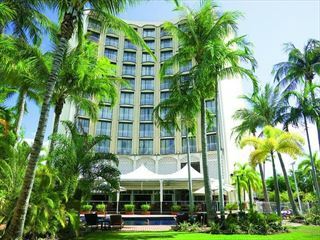 Enjoy comfortable accommodation, delicious seafood and breath-taking balcony views at this fantastic resort. 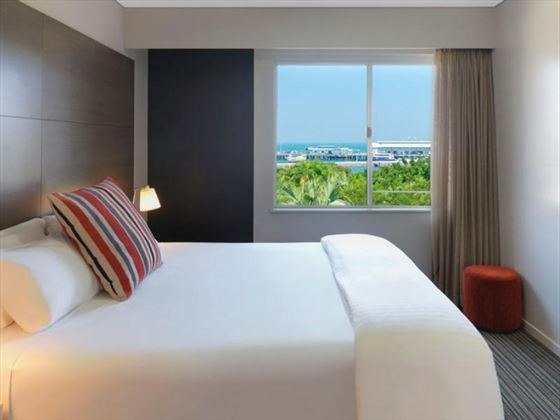 For comfortable accommodation, al fresco dining and a great pool close-by to Darwin's bustling city centre, DoubleTree by Hilton Esplanade Darwin has it all. You'll even get a freshly baked cookie on arrival.